It is never too early to teach kids how to save money. I found a product that will help me teach my daughter how to save money at an early age called the Money Savvy Pig. 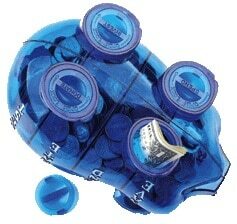 The Money Savvy Pig is not your traditional piggy bank. 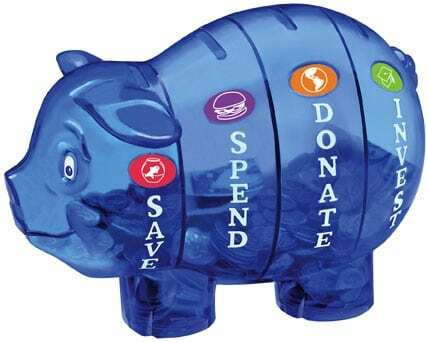 The Money Savvy Pig is a piggy bank with four chambers, one for each of the four money management choices a child should be taught from the time they are small–Save, Spend, Donate, and Invest. The Money Savvy Pig is a money management tool for children ages 4 and above. When we received the Money Savvy Pig, I was a little concerned as to how my daughter was going to react to it. I thought it would be too hard for her to understand how to use it. She is two and the product isn’t recommended for children under 3. I decided to allow her to test the product out with careful supervision. As soon as I took it out of the box she was curious and excited about how to use it. I sat down with her and explained the four chambers: save, spend, donate, and invest. We took out our can of change and started placing one coin into each chamber at a time. As we fed our pig with money, I asked her to repeat each word for me. Although she is still too young to understand what each word means, this pig is a great teaching tool. As a parent, this makes it easy for me and as she gets older I plan to talk more about what each word means until she grasps the four money saving concepts. When each chambers get filled, we will do exactly what it says to do. For example, if the “donate” chamber fills up, we will either donate to a charity, to our church, or to someone in need. When the “save” chamber gets full, we will put the money into her own personal savings account and “invest” in her college account. We will “spend” on items she may have on her “wish list.” The Money Savvy Pig makes it easy for me as a mother to be able to teach my daughter the importance of each basic personal finance concept. My daughter had a blast “feeding the pig” as we called it and didn’t want to put the piggy away! I do recommend this product to you. 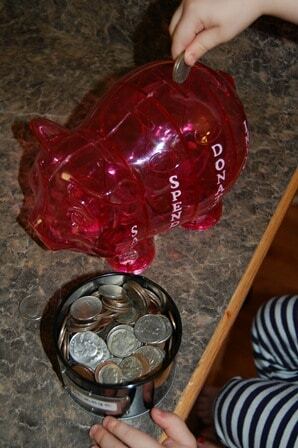 Check out the photo and the video of my daughter placing money into our Money Savvy Pig. You can see in the video that we “missed” the save chamber, but she’s 2…that can be expected! Money Savvy Pig from TheFrugal FreeGal on Vimeo. Disclosure: Money Savvy Generation provided me with one Money Savvy Pig for review purposes. All opinions are my own. Money Savvy Generation is also providing one Money Savvy Pig as a giveaway for one of my readers. What a neat little idea, my four kids would love this. Wow! This is really a fun way to teach kids to save money.For sure they will love this. I love this lady for taking the time to do what she is doing. My favorite post on her blog is about kids in the US being behind kids in other countries. How true that is!! Even though my kiddos are grown, I whole-heartedly remember the efforts I made when they were growing up to teach them about the value of money, saving money, and helping others. I remember thinking that the best “lesson” in any class in school she has ever taken (including elem, middle school, high school AND college!) was when was in the 5th grade. Her teacher did a lesson on how to use a checkbook. They had “play” checkbooks, a starting balance, had assignments to write checks in order to buy something at the store or pay a bill (and the importance of putting your account number on the check memo line) and got “deposits” they would enter. They kept a running checkbook register and by the time she was old enough to have a checking account for money earned from babysitting, then when she got older and money earned through jobs in high school and from particpating in livestock shows (where she won a lot of money), she already knew how to do EVERYTHING and I rarely had to help her with her checking account. I did help her learn to balance her bank statement (I guess they were too young to learn that in 5th grade), but it was a piece of cake for her to learn. There will be many kids in the current generation that will be in for a very rude awakening when they get older. My great-niece is the perfect example of this because she comes from very wealthy parents and grandparents (no offense to them…but this is a perfect example!). I would love to win this piggy bank and give it to my daughter. She is studying to be an elem. school teacher and she would love to have this bank to use as a resource for a money lesson one day!!! Thank you so much for this giveaway opportunity, and kudos to Susan for a GREAT blog!!! This is too cute- I would love to win this for my daughter!